One of the main ways we connect with our potential customers here at Thoughtexchange is through meeting them at the many conferences we attend. Just 25 days into my new role as head of marketing, sales and customer success at Thoughtexchange, I have flown all over the country and attended six conferences. And I am starting to realize the Why. 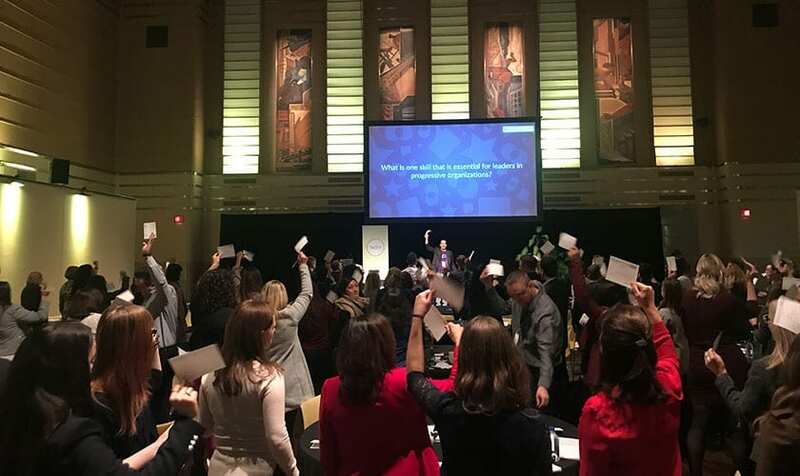 Just last month, I went to the first-ever HELM Conference to join 150 leaders from prominent public and private enterprises on the former trading floor of Canada’s largest stock exchange in downtown Toronto. We were there to trade in the new currency, knowledge—to share ideas about how we can keep a human-centered approach to organizational development as we continue to push the bar of technological innovation. On the stage at HELM, I got to watch our CEO Dave MacLeod lead an exercise called Consensus Building 2.0. He took the audience on a journey that showed the power of group decision-making, and how pairing it with technology can create something magical. Dave started off the presentation with a round of the Group Insight Game, the analog activity that inspired Thoughtexchange’s digital innovation. After handing out cards to everyone in the room, he asked the group to write down their thoughts on this question: “What is one skill that is essential for leaders in progressive organizations?”. People shared the cards around and manually gave each thought a rating out of five stars, through five rounds of starring. While the energy in the room was electric for the moment, I noticed that after the exercise ended there was a feeling of emptiness. Perhaps it was a lack of resulting action, or the ability to know what was agreed upon and how we would move forward. It took about three weeks (and a lot of hair pulling on the part of our staff), to manually transcribe, collate and theme the thoughts shared in Consensus Building 1.0. After all that work, we learned what the most important skills were for the progressive leaders who attended HELM. We’ll be sharing the results with them soon through a painstakingly created infographic. But I wanted to share a sneak preview of their top three themes and thoughts, along with some perspective on the topics I’ve gained through my experience in the business world. I’ve heard lots said on the topic of diversity and inclusion, but more and more, leaders are starting to realize its true power. Autocratic leadership can create short-term gain, but the best companies today are reaching to the edges of their organization to include everyone in conversations. Instead of just compliance, they’re achieving commitment. Thanks to a great mentor I learned that empathy leads to trust, and the only way to obtain empathy and ultimately trust is through insight into what’s most important to the group. Agility is the ability to move quickly—to think and understand on your feet. It’s a factor that’s critical to success in today’s business world, and something many companies struggle with. I heard leaders at HELM talk specifically about the challenges of achieving inclusiveness and empathy while still being agile enough to respond to business challenges. Following the Group Insight Game, Dave ran another exercise called Consensus Building 2.0—this time using Thoughtexchange. He sent out a link to the crowd with the following question: “What are some things you would most like to learn more about to grow as an organizational leader?”. 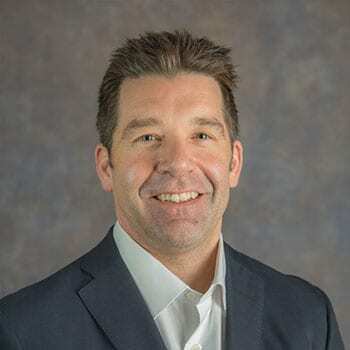 The crowd exchanged thoughts in their own words on their phones, and after a few minutes Dave had in his hands a prioritized digital report of what was most important to 150 business leaders on that topic. It’s no wonder that agility is top-of-mind for these leaders. Today’s companies face an increasing burden to move quickly, diversify their workforces and adapt to a marketplace that’s more dynamic than it has been at any other point in history. That’s where Thoughtexchange comes in. All the leaders at HELM had the chance to share what mattered to them (inclusiveness), consider what others shared and be heard by the exchange leader (empathy). The leader (Dave in this case) learned what mattered to the group and shared the results in less than 15 minutes (agility). By repeating this process with teams and scaling it across whole companies during times of change, leaders can engage people to develop cultures of inclusiveness and empathy while staying agile in an ever-changing business world.